It was hot in the Bay Area last week. Granted, the heatwave only lasted for a couple of days, but when you don’t have AC, it can be pretty miserable. Saturday, the weather finally broke and the cooler temperatures returned. Mr. HapaNom and I took advantage of the cooler weather and had brunch on the patio of a Brazilian place down by the water. I didn’t realize that Brazilian cuisine used curry, so when I saw a cauliflower dish with Brazilian green curry and pumpkin seeds – I was intrigued. The dish was amazing and full of flavor! Even my husband, who is not at all a fan of cauliflower – LOVED it! The cauliflower was obviously colored and flavored by turmeric and spiced with cayenne. I am not familiar with Brazilian green curry, but I do know Thai green curry – which is what I used in this recipe. The golden raisins added a nice sweetness and the pumpkin seeds add a nice texture with a nod to the up coming fall season. Roasted Cauliflower with Green Curry, Golden Raisins, and Pumpkin Seeds. This side dish has got some serious flavor! In a large bowl, add the olive oil, salt, turmeric, and cayenne. Whisk to combine. Add the cauliflower and toss to coat evenly. Turn the cauliflower out onto a foil lined baking sheet. Place in the center of the oven and roast for 30 - 35 minutes. Turn the cauliflower occasionally to ensure even cooking. While the cauliflower is roasting, make the green curry. Combine the first 12 ingredients of the curry in a food processor. Process, adding the water 1 tablespoon at a time until it forms a thick paste. In a medium saucepan combine the coconut milk, chicken stock, curry paste, and raisins. Bring to a boil and then turn down the heat to simmer, stirring occasionally. Allow to simmer for 15 minutes until slightly thickened. Taste and season with additional salt and pepper, if needed. To serve, spoon the green curry out onto a plate. 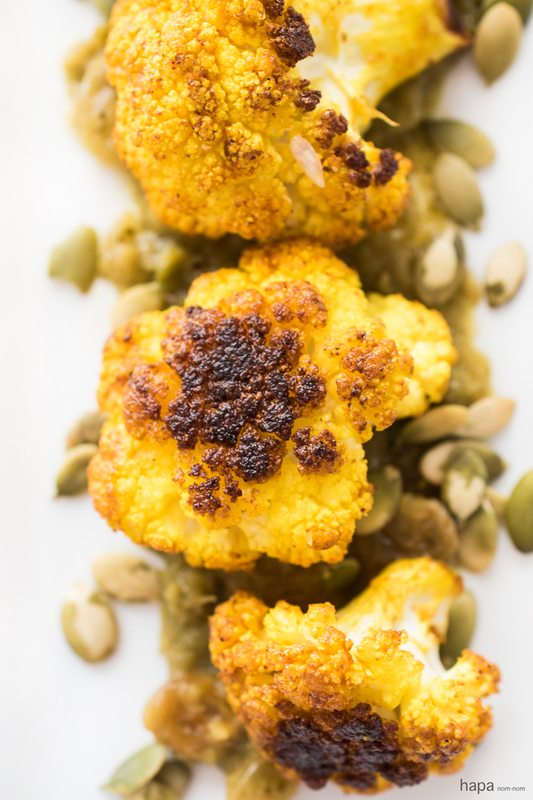 Top with the cauliflower, sprinkle with pumpkin seeds, and squeeze the lemon overtop. Serve and enjoy! This dish looks absolutely amazing! I am not a cauliflower fan but I’m definitely going to give this recipe a try. Thanks for such a delicious idea! It has been so hot that it drives me crazy! Glad it is finally cooling down. Hope it stays that way! I didn’t know Brazilian use curry too! How interesting! These cauliflowers look great and must be very flavorful. They would make such a tasty veggie side dish. I had no idea that there was such a thing as Brazilian curry, either, but what a wonderful-sounding dish! I bet that homemade curry paste is just stunning, too. P.S. I must admit I’m a bit jealous of your heatwave, uncomfortable or not! It’s been Autumn here for a couple of weeks now already, really … bleurgh! Oooh, I love it, what a delicious combination! So pretty, roasted cauliflower is my thing. Love the curry twist you put on this one! Delish! 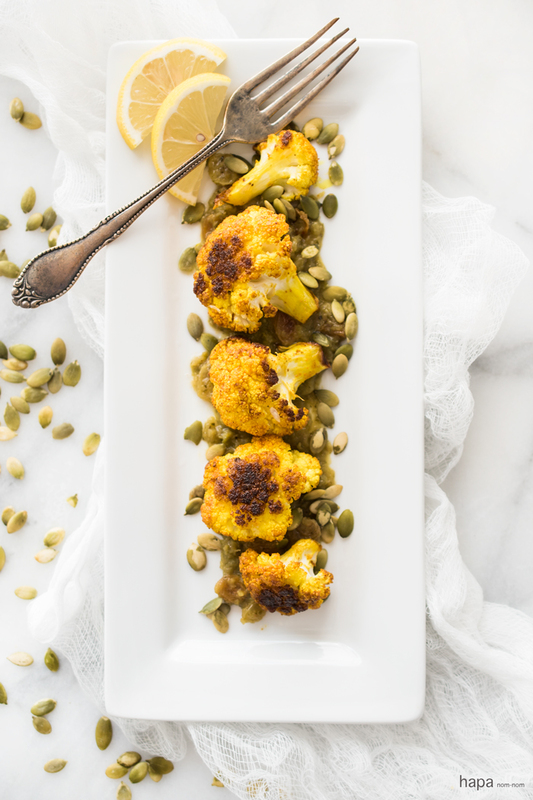 I love cauliflower and this recipe sounds delicious, love the use of the pumpkin seeds and raisins for contrasting textures and flavours. Whoa, this green curry sounds amazing! and love the golden raisins and pumpkin seeds! delicious! Thanks, Alice! The golden raisins do a really nice job of adding a complimenting sweetness to the spicy curry. This looks wonderful! What a great use for green curry! This sounds absolutely wonderful! I’m a big fan of Thai green curry (actually just about anything Thai) and my husband is actually doing better with Thai food (green curry chicken was the first thing I ever cooked for him and he did not it), especially since we did a Thai cooking class in Phuket in 2014. I’m looking forward to trying this. I’m a big fan of just about anything Thai too! A cooking class in Phuket sounds INCREDIBLE! Thailand is definitely on my shortlist of places to visit. Every person that I know who has been there, has said it’s one of the their most favorite places in the world! I love curry anything so this is my kind of recipe. Perfectly roasted, looks delicious. I did not know Brazilian cuisine used green curry, but I would definitely try this dish! Love the combination of flavors, looks delicious! I didn’t either! A quick search online revealed a few Brazilian curry recipes, but I couldn’t find any history of its use in the cuisine. I know you are! Which is why I was thinking of you when I posted this – I’m so glad you approve 🙂 So far, so good in the outdoor temp department – it’s nice and cool today! I have been in a huge curry kick this week and it is still so hot in HK, what is up with that. Now I can’t wait to try your fun Brazilian green curry. I am much more familiar with Thai curries myself too. I love that caramelization on the cauliflower, delicious. Me too… obviously 😉 Hope you have AC in HK! This is the first time I’ve been without and boy when it gets hot, I sure do miss it! This platter is wowlicious, Kathleen. So gorgeous, so delicious and so full of yummy flavors. Thanks, Anu 🙂 I thought it was a nice intro into the fall season. Mmmmm – loving everything about this, Kathleen! From the spiciness of the green curry to the crunch of the pumpkin seeds! My hubby would love this, too! He’s a big fan of curry! Thanks for sharing, dear!